We developed our kidprint ID system in response to the following nationwide statistics on missing children: Every 40 seconds a child is reported missing somewhere in the United States. That is 2000 children per day reported missing in the United States. Our kidprint ID system is designed to assist Law Enforcement and parents in the crucial moments following abduction or missing child incident. Our ID cards are high quality and made to last. The kidprint ID’s are an excellent tool for parents, guardians and Law Enforcement to use in the unfortunate event that their child become one of the 2,000 children missing daily. The ID cards contain the child’s personal information (including name, DOB, address, height and weight), a digital photograph as well the child’s fingerprint. 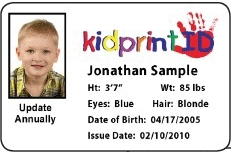 We are seeking sponsors to partner with to promote and provide our new service of digital printed kidprint ID cards. Your sponsorship dollars will provide the parents with two kidprint ID cards for the parent to keep. The ID cards are similar to a driver license in size and design. Card includes steps by step instructions for the parents or guardian to follow should this unfortunate event occur. Sponsors will pay a flat fee upfront for the agreed upon amount of time to do the kidprint ID service. Sponsor’s name or logo will be added to the card and presented to the family provided by the sponsor. Sponsors may request Digital Synergy setup at their location or sponsor a satellite event (i.e. fairs, festivals, school functions, public events, est.) Digital Synergy will be attending. Call (217) 766-8408 or email info@digitalsynergyads.com for sponsorship options and cost.